The Drasphone by R&D CORE Limited tries to combine the clamshell trend of the 90s, and the present touchscreen display trend. 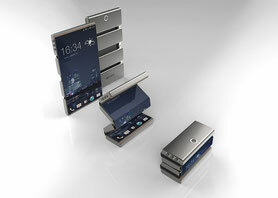 Pioneering flexible display technology, this conceptual smartphone bends at not one, not two, but at three points! This allows you to make the Drasphone compact in two ways. Do a half fold, and you have a Squarish MiniDras, or a complete fold, and you get a MicroDras. If you haven’t noticed, a small section of the display is exposed when in MicroDras mode. This nifty feature allows you to have all your notifications and relevant data visible to you. From R&D CORE (http://rndcore.com/). We have to read a lot about the phone carrying in our pocket. The information is clearly written for every student to gather best values and essay reviews. Then all the people will manage everything with great topics.